When I was growing up, one of my very favorite things to eat was a sandwich of peanut butter and bananas. Back then, eating healthy and nutritious wasn’t even something my family thought about, so unfortunately my sandwich was made with white bread. From time to time, even as an adult, I’ll get a craving for my childhood favorite although these days I know enough to make my sandwich with a healthier whole grain bread. 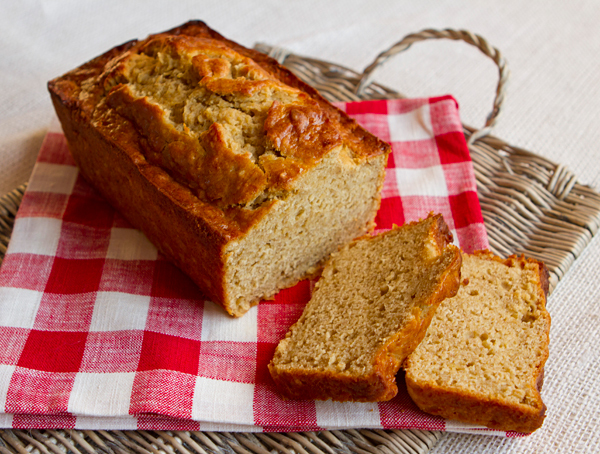 I came across a recipe for a peanut butter and banana quick bread recently that caught my eye and I decided yesterday to give it a try, “rebuilding” the recipe to make it a little healthier. 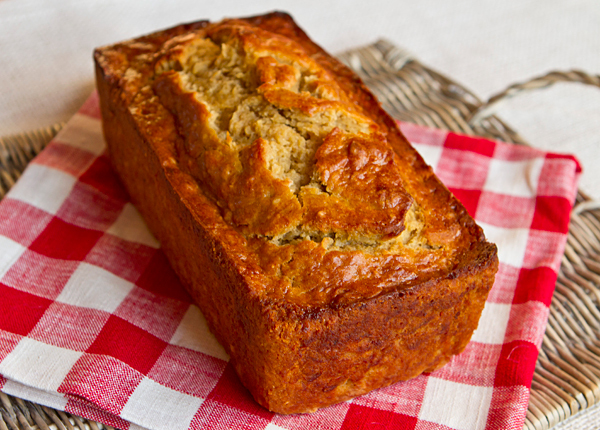 I reduced the amount of butter the recipe called for, replacing it with additional bananas and some fat free Greek yogurt, and I replaced half the white flour with oat flour. The bread turned out great and is very moist and tender and the next time I make it I am going to work on reducing the amount of sugar used. If oat flour is difficult to find, simply place rolled oats in a food processor and process until very finely ground. You could also replace half whole wheat pastry flour for the oat flour. Oats, or oat flour, via their high fiber content, are already known to help remove cholesterol from the digestive system that would otherwise end up in the bloodstream and have special antioxidant properties. Bananas are one of our best sources of potassium, an essential mineral for maintaining normal blood pressure and heart function, making them an ideal food for endurance athletes. Fat free yogurt and additional bananas are used to replace much of the butter used in the original recipe creating a lower fat version. The addition of flax seeds add both fiber and important omega-3 fatty acids. 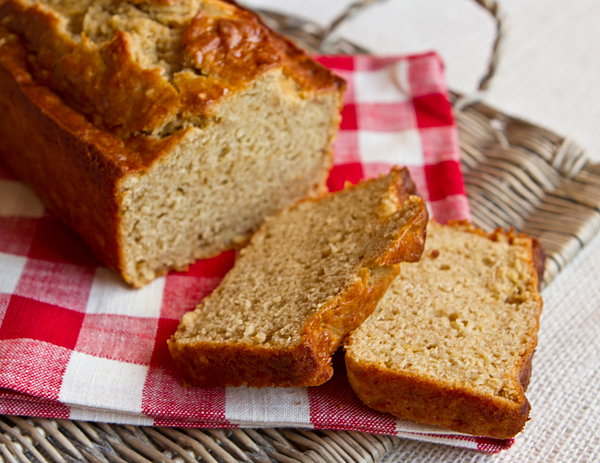 The combination of bananas and peanut butter in this moist quick bread is one the whole family will enjoy. Preheat oven to 350 degrees F. and lightly grease and flour an 8 x 4 inch loaf pan. Mix together the bananas, yogurt, peanut butter, and eggs in a bowl with beater at medium speed until well blended, then add the sugar and blend. In a separate bowl, mix the two flours, baking soda, flax seeds, salt and cinnamon. Add the dry ingredients to the wet ingredients and beat just until blended. Pour the batter into the pan, and top with the chopped nuts if using. Bake the loaf for about 1 hour or until a cake tester comes out clean when inserted into the center.